If you own and operate your own gardening business, you’re likely a master of your craft. Of course, owning a successful gardening or lawn mowing business takes more than the ability to give your customers plush green lawns and beautiful flowers. Odds are, you’ll need a little bit of business savvy so that potential customers can learn about your landscaping skills and so that you can reach new customers easily. Businesses often make the mistake of trying to sell their service, rather than its benefits. You may offer great services and have skilled workers, but that may not be enough to entice potential customers to hire you. The key is finding a way to explain the benefits of hiring your business: try to convey that your customers will have the greenest grass on the block, or the most beautiful landscape in the neighborhood. People will be more likely to be drawn to such superlatives. Also, try to mention the time and energy they’ll save by hiring you to take care of their gardening and landscaping needs. Advertising may have gone digital in recent years, but business cards still haven’t gone out of style. Perhaps more importantly, they are a cost-efficient way to get your name out there. Consider designing gardening business cards that are both colorful and simple. Try to keep things short and to the point when it comes to listing your accomplishments. For landscaping business cards, it’s also helpful to write on the card that you offer “free estimates.” People tend to gravitate to this word, and it could be what it takes to get your foot in the door with some customers. Shopping for gardening business insurance coverage may not be at the top of your list of priorities, but having insurance for landscapers and gardeners that’s simple, affordable, and tailored for you is of the utmost importance. Believe it or not, some customers will check if garden contractors or a mowing business are insured before hiring them. If your business owns vehicles, works with expensive pieces of equipment, or interacts with the public on a regular basis, all of which is likely, public liability insurance for gardeners can help give you the confidence you need to focus on your business. Whether you’re just starting a gardening business or have one that’s been established for several years, it’s hard to be successful without a website nowadays. A good website is one way to establish your company’s brand and reach potential customers you didn’t know were out there. Think of a website as a way to introduce yourself to potential clients. It gives you the opportunity to tell them about your business and what it can do for them. With that in mind, it’s important to have a website that looks professional in order to convey to people that you take what you do seriously. It goes without saying that you want all of your customers to be satisfied with your service, but it’s also critical that those satisfied customers let others know what a great job you did. Nowadays, review sites like Yelp and Angie’s List are an important part of consumer decisions. Your business has much to gain by being reviewed on those sites, assuming those reviews are mostly positive. 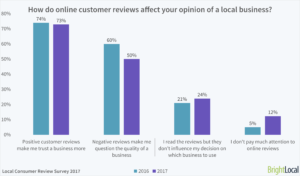 Consider asking your customers, especially repeat customers, to give you a review on one of these sites. You should also make sure to thank customers for leaving positive reviews, as it means they’ve taken time out of their busy lives to help you grow your business. If you’re uncomfortable asking directly, you can also put links to these sites on your company’s website to encourage past clients to leave positive reviews. Sadly, it takes more than a flashy website and positive reviews to build your brand. It’s also important to implant yourself into your local community so that people think of you as more than just a business, but as a friend or neighbor who just happens to be awesome at gardening and landscaping. Consider sponsoring a local little league team or volunteer your services to build a garden for one of the local schools. Doing these kinds of things can help paint your company in a positive light, creating the reputation that you’re all about helping people and your community rather than just making money.